​Arthur Geoffrey White was born on 16 April 1892 to Charles White and Elizabeth née Workman. Together with his older sister, Frances, they lived at Fromebridge Mill where Charles was the miller. The grist mill (which ground grain into flour) was a family business and Arthur was soon involved. The commemoration of 'G. 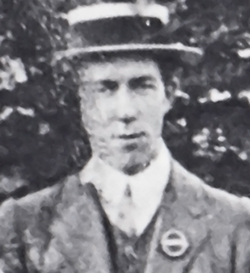 White' on the village hall plaque is believed to refer to Arthur who was listed as A. Geoffrey White on the 1911 census, but in later life was certainly known as Arthur. Although an experienced miller would have had a key role in food production, and could well have been exempt from conscription, it is entirely possible that Arthur served his country, perhaps even taking on duties at another mill. However, no records of his wartime service survive and it is perhaps interesting to note that he is not recorded on the electoral registers in Fromebridge at this time, thus reinforcing the suggestion of his deployment to another mill. On 12 November 1917 Arthur married Mabel Gertrude, the daughter of Richard Ward, whose grocer's shop was situated at the south end of the village green (in recent years a restaurant). Their son, Stanley Arthur, was born in 1918 and later ran the mill. Arthur Geoffrey White's ashes were interred in St Mary's churchyard on 4 October 1975.